We've made it boys and girls, the 2013 NFL Draft. Should be a fun evening as it always is and it could very well get wild. 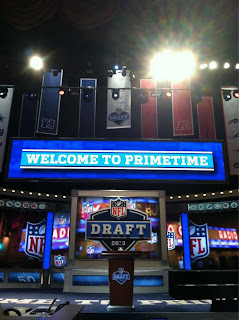 Here I will post live grades of each 1st round selection as they come in, all night long. Let's take a look, shall we? Generally the rule of thumbs is that the usual suspects for the top pick in the draft are franchise quarterbacks, franchise left tackles, or elite defensive ends. With the team cutting Eric Winston, and potentially trading Brandon Albert, they had a need at tackle and as they overpaid for Alex Smith, they need to protect their quarterback, and thus they selected Fisher. Personally I preferred Luke Joeckel, I think he is more of a proven product and less of a workout guy, but not by a whole lot. And as I have said, I think Fisher has the higher ceiling. On the whole, a very good pick. Now you are the Jaguars, you have so many needs across the board, particularly on your defense. So you use the second selection on a right tackle? Even if Eugene Monroe is not your guy at left tackle, this is not a good pick, no matter how much I like Joeckel. This is a safe pick at a position that was not at the top of your needs, I would have gone defense here, in particular the defensive line. Could've sworn this pick was going to be Lane Johnson, particularly with that huge hole at left tackle with Jake Long signing with the Rams. While I am not that high on Johnson, I don't like this move at all. Jordan may be a freak athlete, and has all the potential in the world, but where was the production at Oregon? He was third on his team in tackles for loss. HIS TEAM. And what is the need here? Yes they want a pass rusher opposite Cameron Wake, but Jordan is way too small to be a 4-3 end. I really do not like this selection at all. I had a feeling, a funny little feeling I must say, that Chip Kelly would go with an offensive tackle here but I did not see Johnson being that guy. Now Johnson is not a strict workout warrior, his play at Oklahoma was solid, although not dominant. But before all the workouts and the Combine, he was not a first round selection. He is an athletic freak and has the skills to potentially be the best tackle in this draft. I am not sold yet. Now if this were most other teams, I would not give this pick a high grade, even with the big need for a defensive end in Motown. After all, Ansah is extraordinarily raw as he has only played football for a few years. He was not that productive in Prove and he is pretty much raw athlete. But he is a freak athlete, and note that I said freak. You remember Jevon Kearse? You know who his defensive line coach was? It was Jim Washburn, one of the elite line coaches. You know whose defensive line he coaches right now? The Detroit Lions. Excellent pick. I may look like a hypocrite here after what I just wrote for the Lions, but I do not love this selection right here, even as it appears that Jabaal Sheard is on his way out of town. Mingo is an awesome athlete and he has incredible speed for a pass rusher. But where was the production at LSU? It's not like teams were focusing on slowing him down, because Sam Montgomery opposite him was no clown. This feels like a bust, and this has the feeling of Vernon Gholston to me. Eerily similar. Is this early for a guard? I say no, particularly with how crappy this draft is. While I do think Warmack is a better prospect, this is the right range for Cooper. I think Cooper will be a Pro Bowler. The guy is extremely athletic for a guard, can play all over the line, and it very experienced. Vince Lombardi would love how well Cooper can pull. The Cardinals have a garbage offensive line, we all know that, so really any pick there is a big help. I do not care about Austin's size, or lack thereof. This is a guy that is absolutely special with the ball in his hands, no matter how he gets it. The Rams do not have anybody on their roster with that capability. They also have needed to find a top weapon for Sam Bradford for years if they want him to become a franchise quarterback, and there is a hole in their slot with Danny Amendola signing with New England. The only downside would be if they gave up an exorbitant amount, which I doubt. Can I say this, I absolutely love Chance Warmack. If he were a woman...I'm not going there. But I think Warmack is all but a lock to be a consistent Pro Bowler. He was fantastic at Alabama. Jon Gruden had a great line about his mediocre 40, "don't count 40 times for guards." Not to mention who coaches the Titans, Mike Munchak, a Hall of Fame guard himself, which is something I have pointed out 1,489,526 times. They need Jake Locker and Chris Johnson to succeed, and Warmack will make a brilliant guard tandem with Andy Levitre. Yeah, we've got a run on offensive linemen for damn sure. Problem is, I am not a fan of Fluker for the Chargers. Yes, he is a true mauler in the run game. He is also versatile and would be a quality guard for a team that needs it. But this is a reach because Fluker is strictly a right tackle, he will get killed if he is a blindside guy. He really has to work on his passing game, or Philip Rivers will continue to be on his backside. This grade automatically goes higher because I love their move to move down and pick up another second round pick. This is a club that has a lot of needs and moving back was wise. And yet, I do not like this pick. First, I think Hayden is a fine player, but not worthy of a selection this high in the draft, even with the need for cornerbacks. But their biggest hole was on the defensive line and look at all the defensive tackles available: Star Lotulelei, Sharrif Floyd, Sheldon Richardson. Man, how great would Geno Smith have been here. Regardless, the Jets make another quality pick here with this Missouri prospect, even if Star Lotulelei and Sharrif Floyd are still on the board. The Jets need upgrades on their defensive front and while Richardson is not a perfect fit for the 3-4, every team should want a disruptive presence like Richardson on their line. His motor is relentless and he moves very well for his size. Finally, the top player on my big board is off the board. We all knew the Panthers would be happy if ANY of the elite triumvirate of tackles would be available, and with both Lotulelei and Sharrif Floyd available, it's Christmas. Don't pay any attention to the heart issues from the Combine, those were a fluke. He is a beast, just watch his tape from Utah. He will immediately upgrade a crap Panthers defense that was BRUTAL last year at tackle. Great stuff. The Saints' defense was bad. Really, really bad. They had a handful of talented defensive prospects available here to select and they got a good one in Vaccaro. Vaccaro probably will not be Troy Polamalu or Ed Reed but his instincts are fantastic, always a good sign for a safety. He is not a great centerfielder but he has the ability to cover the slot and tight ends, key playing for a team that gets in offensive shootouts frequently. We all know the Bills needed to finally develop a franchise quarterback. Moving down made a lot of sense, especially as all the quarterbacks were available here. But with Geno Smith on the board, with Doug Marrone's college product Ryan Nassib on the board, with Matt Barkley on the board, the Bills took E.J. Manuel. First off, I feel confident he will not be a good player, he was very erratic at Florida State and was a universal disappointment. Not only that, he is not a good fit for Marrone's scheme. Huge reach, awful pick, classic Buffalo? This is why the Steelers are a great organization, because they take advantage of their competition being morons. Take away the workout nonsense, take away the minute health concerns that Georgia had no issues with, Jones is a top five pick. Watch the take at Georgia, the guy was dominant with a capital D. For a team that has had its share of fantastic pass rushers, even with their disappointing pass rush a year ago, Jones should fill the hole of James Harrison right away. Many had a feeling that the 49ers could make a move with all the pick they have, but I do not love this pick. I don't love this pick because I felt that the 49ers could have one of the top remaining safeties (Reid, Jonathan Cyprien, Matt Elam) at 31, so I don't love the move up. However, Reid is a good fit for the team, particularly after the team lost Dashon Goldson to Tampa. He is not going to be a centerfielder but he is a vicious hitter that excels in run support. This was not the pick I was thinking for the Giants. And I will be honest, I think Jerry Reese is a tremendous drafter, but I do not love this selection. Pugh is versatile and may end up at guard, which would be a good move because he would likely be miserable at tackle, particularly left tackle. He is not particularly athletic and most troublesome is his short arms. Not many tackles succeed with short arms. He's not a terrible prospect, but this is early for him in my opinion. Man, the offensive line picks KEEP ON COMING (sorry for the caps). I think Long is a solid prospect, but I think this is too early for him as he is very raw and needs a lot of coaching to improve. He does not have a big body of work in Eugene and while he is very athletic, he struggles to play at a low pad level, especially due to his tall frame. The Bears always need line help, but Long will not be an immediate contributor. And there were better prospects on the board. I love this new trend in the NFL of teams utilizing multiple tight end sets, and a combination of Eifert and Jermaine Greshem will be delicious for Bengals fans, and most importantly for Andy Dalton. Wasn't a huge need, and Alec Ogletree would have been a very good pick, as would a safety, but I still really like this selection. Eifert may not be Rob Gronkowski, but he is pretty athletic, runs very good routes and can line up anywhere. Although I liked Xavier Rhodes a little more, a quality pick at a big need for the Falcons. With Brent Grimes and Dunta Robinson both headed elsewhere, the Falcons desperately needed some help at cornerback, particularly in a division where they play guys like Drew Brees and Cam Newton four times a year. Trufant's bloodlines are intriguing, but the guy played very well at U-Dub and he made himself a lot of money with good performances in Mobile and Indianapolis. Can somebody give me a good reason why Floyd was available with the 23rd pick? Makes nose sense to your humble correspondent, I am a big Floyd fan. He's a great pass rusher from the interior whose motor never stops. He is faster than defensive tackles normally are. For a club with a big need at defensive tackle next to an aging Kevin Williams, this is fantastic value. The Colts struggled to apply much of a pass rush in their first season with a 3-4 defense as both Dwight Freeney and Robert Mathis were disappointing. Now with Freeney gone, they really had to find a disruptive presence and thus Werner makes a lot of sense. Werner has seen his stock drop of late but I'm not entirely sure why, I love his pass rushing abilities. He is not the most athletic guy out there, but he is more than athletic enough to excel on the edge. Yeah, I nailed this selection, so there's that. This pick makes a lot of sense for the Vikes, their secondary play was subpar last year and they had a hole at corner after cutting the aging Antoine Winfield. And Rhodes is tremendous value at this selection, many thought he would be going higher than this. He has impressive size and loves to get physical at the line scrimmage. Many feared that he did not have great top-line speed, but he had a quality 40 yard dash. The Packers are a good drafting club and they have done it again with a tremendous selection. One thing that is a weakness on the Packers' 3-4 defense is their struggles to generate the passer outside of Clay Matthews and from the defensive front. Jones helps in both regards. He is very athletic for his big frame and he explodes at the snap. His hustle is pretty much relentless and is consistently in opposing backfields. A very good pick. For how long have the Texans been trying to play off that Kevin Walter is a starting wideout, that scrub couldn't draw attention off my ex-wife, let alone Andre Johnson. Houston needed to find a threat opposite Andre Johnson, and this is a tremendous pick as I really like Hopkins. He reminds me a lot of Anquan Boldin, not the fastest cat out there but runs great routes, has very good hands and is physical. And he blocks well, whych we all love. Man, John Elway has really shown himself to be a solid personnel guy, something I didn't see coming. This is a very good pick and a very good value as Williams was one of the top guys on the board available. Defensive tackle was a position in transition for the Broncos and one where they needed upgrade over what they currently had. He can play a variety of tackle techniques and he is a tremendous run stuffer. He will never be a big pass rusher, but I think he is better than folks give him credit for there. And we all thought that they sold the farm for Manti Te'o, so that was fun while that lasted. I was just wondering when the Vikings would take a wideout, because they had nothing there save for the signing of Greg Jennings, who does have some injury issues. This is good value for Patterson, who was inconsistent in Knoxville and is very raw but he is seen to be quite possibly as physically gifted as Julio Jones, although I would hold the phone with that action. This is another fantastic value pick, although we know why Ogletree fell. After all, he has his fair share of character issues, no less to mention getting a DUI on the eve of the Combine. But you cannot deny how talented Ogletree is. He is a tremendous athlete, he is a converted defensive back, and he has that ideal combination of speed and size. His long arms are a big plus and he will be a much needed addition to a Rams linebacking unit that needed an upgrade. You know what is great? Many thought they would take Ogletree at 16. And Jeff Fisher has no issues taking chances on talented players with some risks (Janoris Jenkins, anyone?). You want to know my reaction to this pick? The classic "meh." The Cowboys have a lot of issues in the interior of their offensive line at both guard and center, and Frederick should be able to help in both regards. But I think this is a little early for Frederick here. Yes he does have excellent technique and is pretty strong, but he is not a first round caliber player. I think Larry Warford of Kentucky would have been a better selection. Man, that was a darn quick selection, but this pick makes a lot of sense. It would be unfair to compare him to Ed Reed but that is who he will be replacing in Baltimore. He is a big hitter, a BIG hitter, he is very physical and he flies all over the football field. He will not be the centerfielder Reed was but he should be a solid cover guy should he be utilized in that regard. And he does not have an agent, which means something.